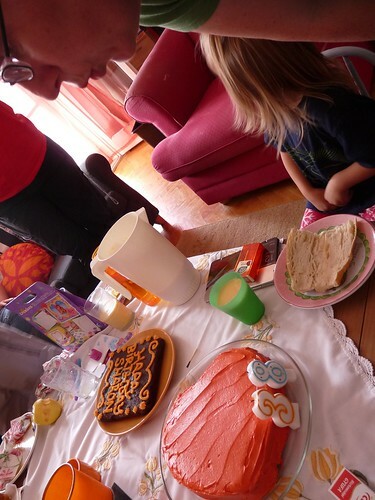 Above: Yes that is a '3' and an '8' leaning against the birthday girl's orange cake. Thankfully I (Allen) did not make any of the cake but was only responsible to light the candles. I think I am blessed most with Sharon's birthday, and I continue to be amazed at God's grace in giving this special woman to me as a wife. Though the '3' and '8' put together add up to 'old', Sharon continues to look and act as young as she was when I met her. I am thankful that God made her, and especially thankful that God made us to be one as husband and wife in this world. 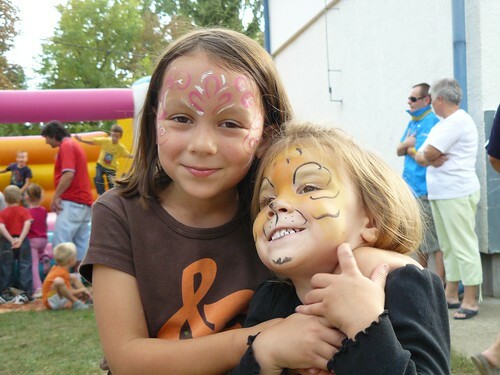 Above: Elianna and Kira having fun at an event organized by the local preschool. 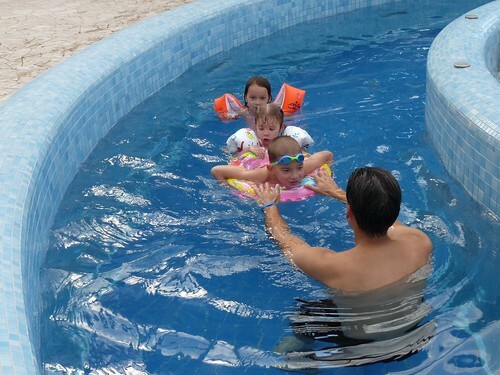 Elianna is continuing to progress in learning to read and Kira is doing an excellent job navigating through her first year of submersion in the jungle of Hungarian preschool. Every other day, Kira tells me how one of the boys hit her in the head or pushed her off the couch. Thankfully she gets over these things pretty quickly (the tiger that she is). Kira also seems to be doing well picking up the language. She has already learned her first Hungarian nursery rhyme. Above: Ben, who just learned how to ride his bike a few weeks ago, showing off his ability to now stand up like daddy on his bike. Above: Of course, Kira was quick to follow and say, "Look at me daddy!" 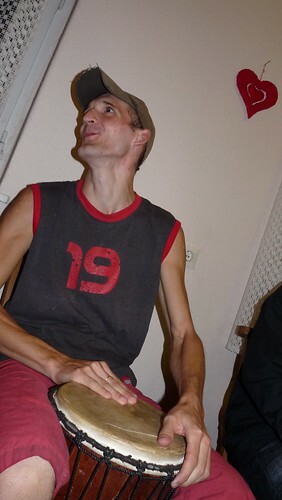 Above: Special guest EnikÅ‘ who was saved at our last English camp attended our outreach on Friday. In our small group discussion, she was bold in sharing that her most valuable possession in life is her relationship with God through Jesus Christ. 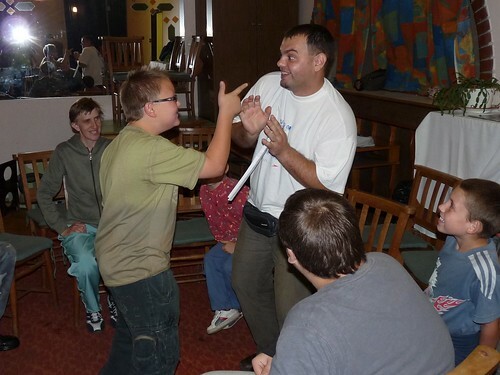 Above: Miki improvising with Ádám who attended our VBS and continues to attend our Friday outreach. Above: This was Virág and Dia's first time attending and Hugi (far left) did a great job helping them feel welcomed and accepted. Above: Betti (far left) who initially heard about our Friday night outreach at our Englsh Bible study now comes every week and brings friends. Betti also has begun attending our church! Above: Eszti and husband Peti (who was saved recently) come an hour early every week for our ministry training class and prayer before our outreach. We are looking forward to baptizing Peti (who has been attending our foundation of faith/baptism class) in the near future. Above: We had a good number of campers show up for our reunion and were thankful to catch up with many of them. Above: Niki who has been attending our church for almost two years and has professed her faith in Jesus also attended. Please pray for Niki who has a very tough home situation, a new school that she is adjusting to, and a new faith that she sometimes wavers in. After attending our foundations of the faith/batism class on Sunday's she has decided not to be baptized at this time. She wants to be sure of her decision and I want to be sure of her understanding of the Gospel. This is a time when the enemy will flood her life with all kinds of distractions and temptations. Pray for her to be strengthened in her faith and understanding of Jesus and pray that she would be protected from being drawn into a path that leads to destruction in life. 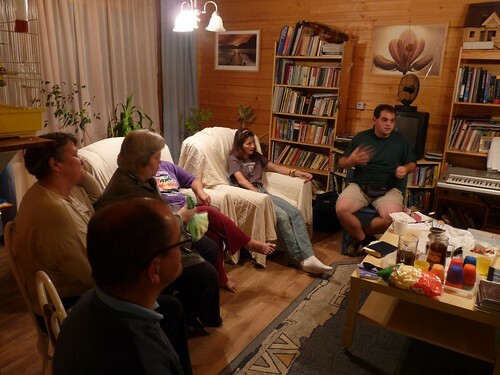 Above: Our church was invited to introduce ourselves to the church plant in Rakoskeresztur on Sunday morning. Miki gave an overview of how God called him to plant in PetÅ‘fibánya, and Gabi and Hugi shared how Jesus was working in their lives. What a joy to see Hugi and Gabi who were once lost, standing in front of a congregation giving praise to Jesus for His grace. 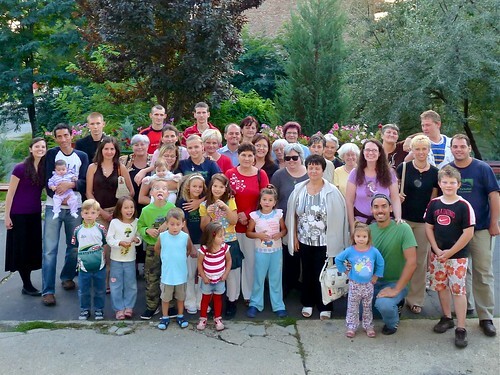 Afterwards, we split up and joined various Rakoskeresztur families for lunch. It was great to hear personal testimonies of how God brought salvation into their lives. One person told me about her upbringing in an atheist home, with a father who ended up committing suicide and a mother who was an alcoholic. Later social services took her away and put her in the care of a loving family and throughout that time she was attending a youth group outreach attracted by the atmosphere of love and acceptance. As time went by, she came to know her personal need to repent of sin and to believe in Jesus as her Lord and Savior. Afterwards, she felt a call to reach out to kids who have similar difficult experiences, sharing Jesus with them. Unfortunately, her background experience with a family member committing suicide and another an alcoholic is not rare but common here in Hungary. Praise Jesus that He entered into her suffering and brought her out a daughter that will be effective in bringing others out to meet Jesus. After lunch, we loaded the car back up and headed back to PetÅ‘fibánya to begin our worship service in the afternoon. Above: Roger and Hiedi's daughter Emily drawing a crowd after worship service. Just before service, Edina, who attends our English Bible study, was just about to walk in. Unfortunately, her son who doesn't know us or those in our church very well, was very much resisting the idea of coming to church. All I could do was pray as she was in the midst of convincing him to come inside. In the end, she was able to come but I can see the various ways that the enemy is making her journey as hard as possible. Edina's daughter who also began attending our English Bible study and afterward our Teen Outreach, has now begun attending our church. What a joy to see God drawing this family to Himself. Please pray for Edina, for Noel (her son) and for Betti (her daughter), that they would all come to know just how extreme and faithful the grace and love of God is in Jesus Christ. Timi, our next door neighbor owns a local barber shop just a two minute walk away from our home. While getting my hair cut on Thursday, a friend of Timi's entered and began sharing about how she continues to be in pain and has begun to visit various healers. She said, "I just don't believe when they lay their hands on me anything is happening and I don't feel anything. They told me that I would believe when I am healed." I sat and listened as Timi sliced and diced my hair. I remained silent, but the Spirit was giving me a very strong urge to tell her about Jesus, the ultimate healer. After paying Timi for the haircut, I turned to Timi's friend and said, "You don't know me, but…" I went on to tell her about Jesus' love for all people and his desire to bring ultimate healing. I told her that He is more concerned with healing the heart and the deep sin problems within us that sometimes lead to physical sickness. I hope this brief encounter will have planted a seed in her heart to find out more about Jesus. May He continue to reveal Himself to her and protect her from false teaching that is prevalent in Hungary. Above: Miki faciliating a discussion about success and how we define it. We broke up into small groups and spent time meditating on Psalm 1 where success is shown to flourish as one constantly nourishes himself with God's word. As we continued to talk, two of the elderly women in my small group shared how lost they were before finding our fellowship. They saw no hope in life and were deep in depression. God has been gracious to lift them both out of this dark place and reveal new life to them in Jesus Christ. Ildikó, mother of Zoli (who put his faith in Jesus in one of our English Camps), has been reading through the Psalms as she continues to go through a dark time in life. The tough events that have piled up have turned her to the only One she can truly put her trust in. 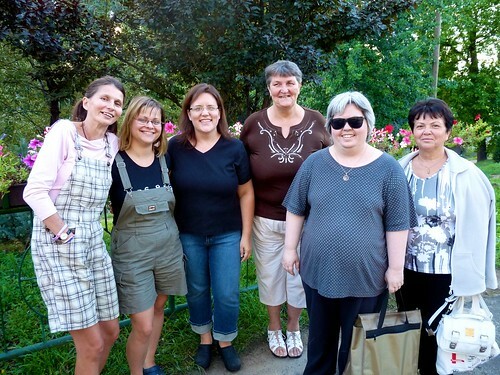 As we shared our thoughts in closing, Ildikó said, "I found out what success is, when I find myself in God's word". Above: We are thankful for kids who were new just a few weeks ago, showing up again each week. God seems to be giving this outreach momentum as we are having more opportunity (without distraction) to share the truths of Jesus Christ with a new generation. The teens enjoy the time where we are seated in a circle with Miki leading worship songs and have been attentive as we ask important questions for them to consider in life regarding faith in Jesus. Just this week, we began meeting an hour earlier with church members Hugi, Eszti, Peti, Gabi and Niki who consitently attend. We have begun teaching them about what it means to be a servant of Jesus Christ in this ministry and we spent time in prayer together. It is very encouraging to see the slow but steady process of growth in our church and there is great joy in passing the baton to others to run the race set before us. 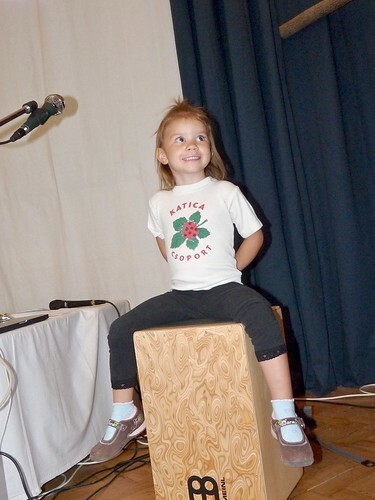 Above: Kira having fun on daddy's drum. 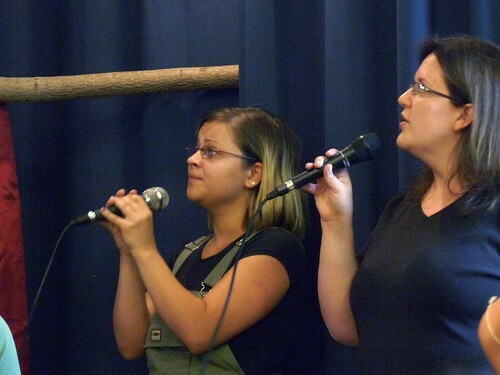 Above: Sharon with friend Eszti who is now serving in our musical worship group. After sharing the Lord's Supper together, guest pastor Péter preached on the goal of pursuing peace in relationships as our Father is a God of peace. As I talk with more people and survey the weakness of our church, it is very evident that this culture suffers from even the basic understanding of a peaceful relationship. The majority come from broken homes, with parents that have verbally abused them, or ignored them as they drown in alcoholism. The tendency is to turn inward and to believe that no one can be trusted. Unfortunately, this defense mechanism builds up barriers as they encounter our gracious God. Many only allow Him to speak to them at a distance, but do not fully trust Him yet. Without fully experiencing His love, they then struggle in loving others. Without having any examples in their lives of faithful relationships, they are stuck in a vicious cycle of turning inward and remaining hopeless and depressed. It will only be by God's grace and the work of His Holy Spirit that will break through and reveal to them God's love. Please pray for our church and for the many new believers who need to experience the Father's love. Pray that they would be filled with the love of Jesus and be able to love others in a way that brings peace and glory to God. Above: Miki sitting next to some new teens that attended our weekly outreach. 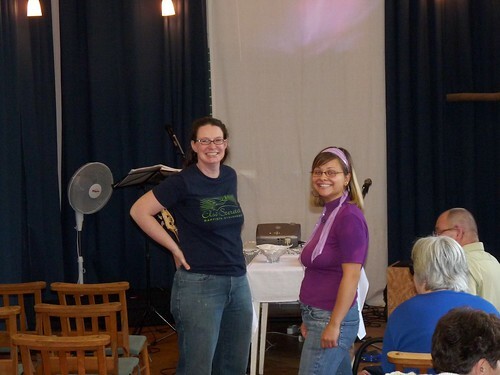 Dori seated next to Miki attended the Western Weekend Family Camp a few weeks ago. She came all the way from Gyöngyös (a half an hour away) to attend tonight. We are thankful that Dori also has an opportunity to attend a church plant in Gyöngyös that we often partner with in evangelism and discipleship ministries. God is continuing to draw new teens, and the crowd is growing. Please pray for us to make the best out of this opporunity to minister to these kids, most of whom come from broken homes and an atheist background. 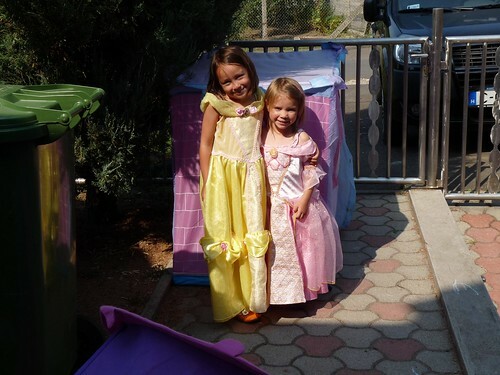 Above: Elianna and Kira in drama queen mode (in a good way). The kids often spend time planning out their own shows with tricks, singing, dancing and racing. 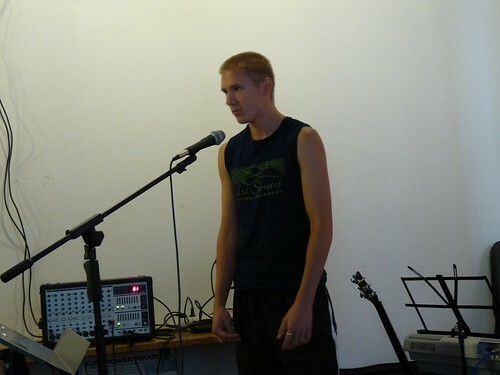 Ben usually reads from a paper and announces each act. Very creative and ammusing. 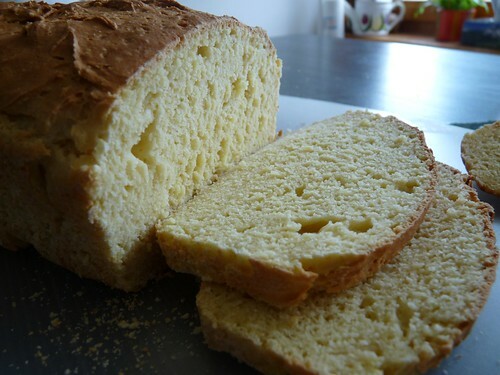 Above: After many failed attemps of making gluten free bread taste less like chewing on a foam cup and more like bread, Sharon finally found success! Sharon continues to add to her list of baked goods that Elianna and Ben can enjoy without holding their nose. Praise God for his help in this process of finding new recipes for the kids. Above: Miki teaching in our foundation of faith/baptism class. At the end of service, we prayed for our teammate Brenda who is returning to the US for furlough. Brenda has been a special help in the womens lives in the church and will be leaving behind a women's prayer group that she initiated. Praise God that the women will continue this ministry and are growing up in their faith to take on more responsibility. Sharon had a parent meeting at preschool today and was happy to hear the teacher promote Miki's Bible class for the kids which the parents have to give permission in order for their children to attend. What a blessing to have a non-believer actually function as an advocate for this outreach! We are also very thankful for this open door in public schools for Miki to teach God's Word. Thank all of you who have been praying for our team as we plan our next steps in local ministry. We have had a very fruitful series of meetings and are united in where we sense God leading us in ministry. 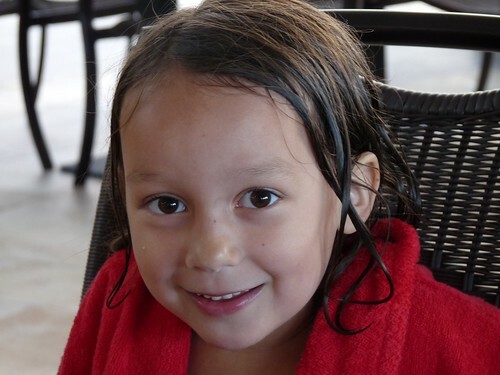 Above: Kira began preschool and has done quiet well adjusting to it. It helps to have her sister Elianna there to see on the playground as mostly everything else is new and confusing. 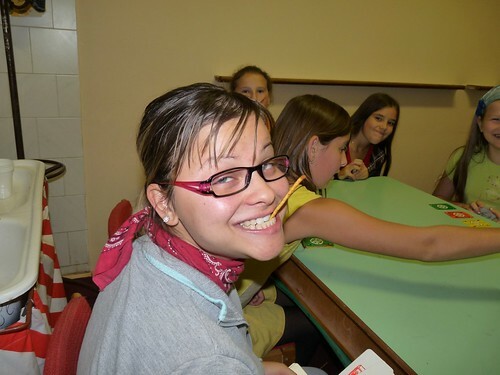 The change in Elianna's diet due to celiac disorder has helped her in having more emotional strength and in contrast to last year, she is connecting with other girls in her class and speaking more and more in Hungarian. 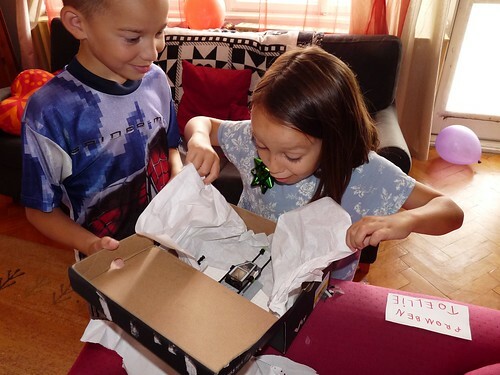 Above: Benjamin giving Elianna his customized lego gift on her birthday. Elianna turned six last thursday and we celebrated with Sharon's special gluten free cake and a trip to Aqua World water park in Budapest. The kids had a great time. We were thankful for Klári, Erika and Edina who continue to attend our English Bible study. Klári began asking questions about whether or not I EVER regretted leaving behind the US, and my carear to follow Jesus' call to Hungary. I could honestly and excitedly tell her that I have NEVER regretted living in the new life He has given me. Although it has its share of suffering and hardship, I find fulfillment, peace, satisfaction and joy in a restored relationship with God and in living according to His good will. 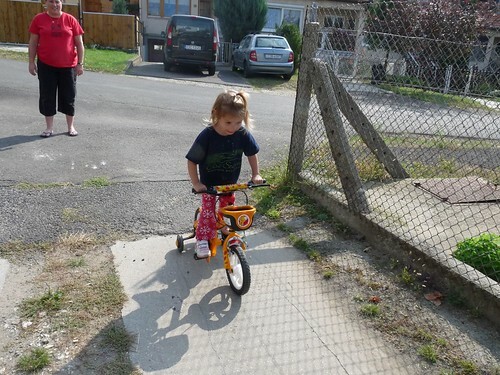 It was clear that Klári was trying to get her mental arms around the drastic changes that have occurred to lead our family, Roger and Heidi and Brenda to this small town in Hungary. 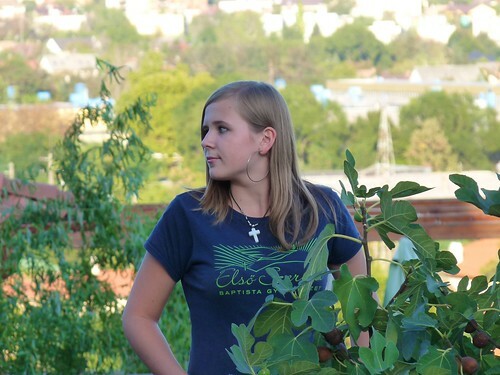 Please continue to pray for Klári to grasp the amazing truth of the Gospel and that her husband Tibor may also be saved. Miki continues to hold a Bible study at his house on Tuesday for young believers and those open to hear more, and a Wednesday Bible study for church members. He has seen God doing amazing work through these times seeking to know more about God's word. 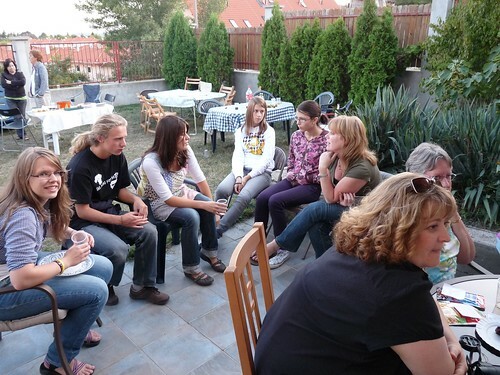 Church member Marika has often invited a neighbor Gizike to church. Gizike responded and attended and also began attending Miki's Bible study. After years of suffering from depression and haunting sorrow for the loss of her son, God freed Gizike as she learned about taking her burdens to Him and seeking healing in Him. Afterwards, Gizike was learning for the first time what Jesus taught about forgiveness and she recognized that she was holding a vicious grudge against two people for years (a common thing in this culture and in this town). By God's grace and His work in Gizike's heart, she was able to forgive these two people and shared this with the small group. After God took her through these steps of healing, He opened a door that had been shut for years related to the grudges that were held. Apparently, Gizike had a house that she had been seeking to sell for years and it had become a great burden. After Jesus freed her from her anger and holding a grudge, people showed up that week, looked at the house and signed a contract to purchase it. Praise God for His work in Gizike's heart and life to reveal His power and HIs love toward her. Another amazing thing that happened in the small group was the bringing of peace between a few women in the church who had a misunderstanding with each other. I count any reconciliation and offering of forgivness in this culture as miraculous as it is completely absent in upbringing and even missing in the teaching in many churches. The probelm erupted in response to gossip which we have also been seeking to eliminate int he church through teaching about who we are in Christ. Through this teaching and offering environments where people can share hurts, work through misunderstandings and practice Christian love, there has been healing and reconciliation. There is great joy in these amazing works that only God can be given credit for! 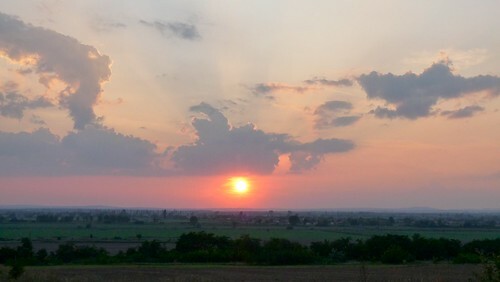 Above: PetÅ‘fibánya sunset on Thursday night. Miki, Erika and I met with a mother and son on Thursday night that continue to seek answers about life as they have recently gone through very tough times. "For as I passed along and observed the objects of your worship, I found also an altar with this inscription, ‘To the unknown god.’ What therefore you worship as unknown, this I proclaim to you. The God who made the world and everything in it, being Lord of heaven and earth, does not live in temples made by man, nor is he served by human hands, as though he needed anything, since he himself gives to all mankind life and breath and everything. And he made from one man every nation of mankind to live on all the face of the earth, having determined allotted periods and the boundaries of their dwelling place, that they should seek God, in the hope that they might feel their way toward him and find him. Yet he is actually not far from each one of us..."
What also powerfully struck the son (who is a painter) was turning his attention to the reality of the Creator behind creation. God provided a beautiful moonlit sky under which we shared dinner and conversed. I commented that no one looks at a painting and begins talking to it to find out why the painting made itself. Behind every painting, there is a painter, and behind the beautiful creation that we see this night is a Creator. We must first go to Him to find meaning and purpose in life. He commented that he has become interested in psychology which led to a discussion of the futility of man's solutions to man's problems when man cannot escape the problem of death. God continued to bring the conversation back to His Son Jesus and I sensed no resistance, but rather found him joining in with each thought and agreeing. He seems to be very perceptive and is a deep thinker. Although they both expressed interest in church, they did not attend on Sunday. The son also expressed interest in going to our English Bible study, but did not attend. Please pray that the door to share the Gospel of Jesus Christ with this family would continue to be held open by God's grace and that He would save them! Above: Praise God for drawing these teens to Himself! This is the first time I have seen all the teens singing together and participating in the discussion with hardly any distraction. God seems to be giving a bit of traction to this weekly outreach and we are hoping to discuss this week ways we can better use the time to help the teens see Jesus Christ in His Word, in song, in prayer and in teaching. 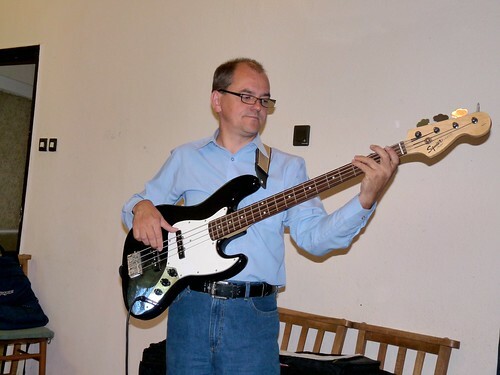 Above: DezsÅ‘ (playing in Sunday service) who represents the head of the first family who became members in our church has grown so much over the past few years. God has been helping DezsÅ‘ develop the pastoral gifts He has given DezsÅ‘ and just this past Saturday DezsÅ‘ began his first day at Bible School! This is such a great provision as it allows DezsÅ‘ to learn through corrospondence with the requirement of meeting professors one Saturday a month. 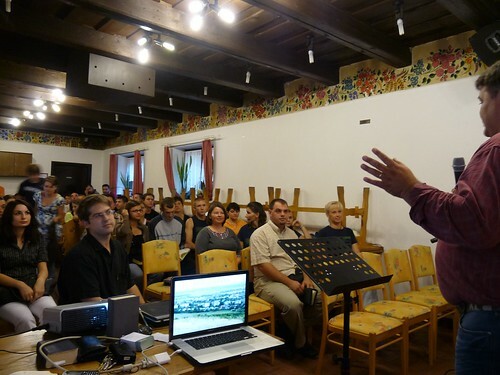 DezsÅ‘ is seeking to faithfully prepare himself for the ministry of serving as a pastor that God has called him to. Gabi K., has also been accepted to the school and is attending with Miki and Peti (who are auditing the courses). Pray that the Lord may bless them as they seek to know Him through the gift of His Word, and that they may become faithful teachers of God's Word. Above: Norbi, Peti and Niki continuing to attend classes on foundations of our faith and preperation for Baptism. What a joy to see new believers hearing amazing truths for the first time. We have been studying over the past few weeks the revealed law that judges even the activities of the mind and heart, and the amazing grace that God offered through Jesus Christ, the only One who fulfilled the law. Above: Baby Emily (Roger and Heidi's daughter) giving aunt Brenda's finger a squeeze. Above L to R: Hugi, Eszti, Brenda, Erzsi, Anita and Marika. Brenda has done a great job bringing these women together for an hour of prayer each week. This prayer meeting has strengthened their fellowship together in Jesus, and is an encouraging time to bless one another and the church with specific prayer. Above: Kids joining in up front for one of our worship songs that they had already learned in this year's VBS. Above: Just a few precious stones in God's church building. 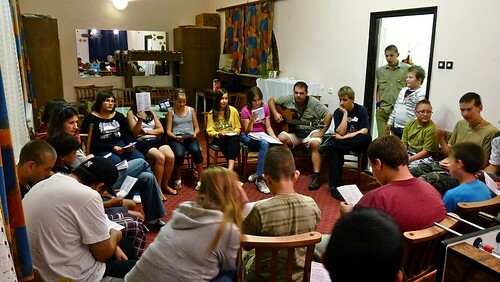 > Praise God for Miki being able to form four Bible classes in public schools in our area. 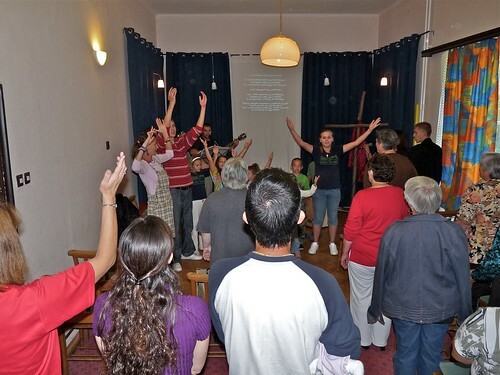 > Praise God for DezsÅ‘, Gabi, Peti and Miki having an encouraging first day of Bible School. > Praise God for our children's smooth transition into school (Kira doing quiet well in this new environment). > Praise God for the open door in Thursday's meeting with a mother and son who are seeking. 1. Pray for our team in this new semester as we seek God’s will in adjusting our lives to join Him in His work. (Clarity of vision, wisdom and unity in decisions) We will be having meetings together Thursday and Saturday.